Visiting Gettysburg and other Civil War battle sites and reenactments, I learned that during many battles, the citizens of local towns would go out as spectators to watch the skirmishes. I captured this photo at the Western Reserve Historical Society’s Hale Farm and Village annual Civil War reenactment. 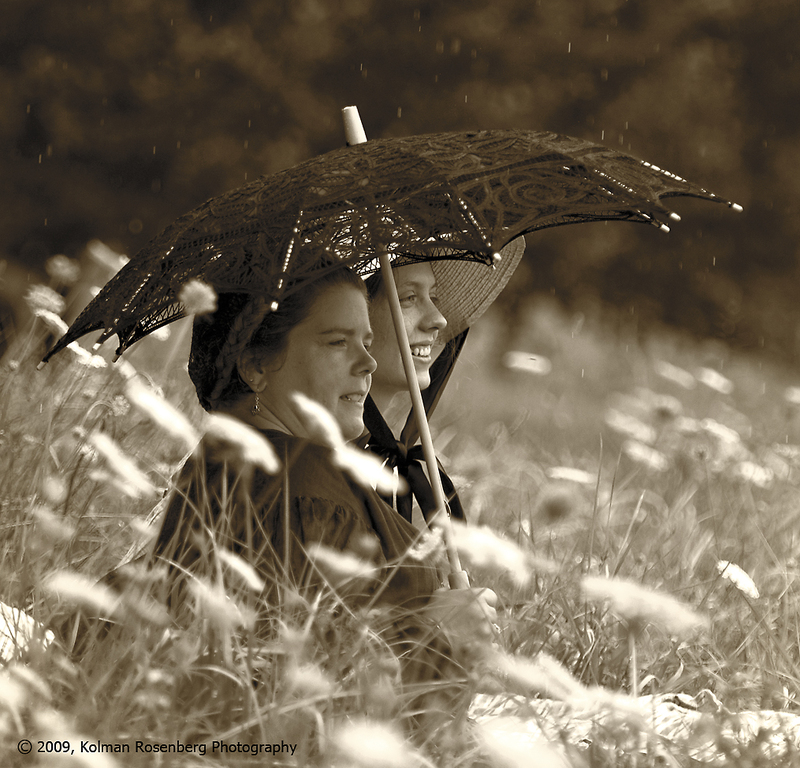 These two women accurately reenacted that practice by going out into the pasture with a sun umbrella, in the pouring rain, to watch the battle. I was there for the most part to capture photos of the military reenactors and was rather surprised to see them walk across the pasture and sit down not too far from me in the waist high weeds. They made for a wonderful photographic subject. This entry was posted in Uncategorized and tagged battle, Civil, Civil War, hale farm, Historical Society, reenactor, Skirmish, Spectator, War, western reserve. Bookmark the permalink. What a fantastic photo. It tells another story of the war, doesn’t it. ? Thanks Barb, yes, I think it tells a very different story that usually goes untold. I happen to be one of those women; the other woman in the photo happened upon this beautiful shot searching Google Images. Thank you for capturing such a wonderful memory for the two of us. Wow, well I’m certainly glad you came upon the image! It’s one of my favorites and in fact has hung in several exhibits. I’m glad you like it! Hello Rob, I will check and see but I don’t think so. As you can see I was on the other side of the meadow and of the fence! I may have some of one of the crews practicing before the battle. If I do I will let you know. Thanks for your comment!